I've been enjoying The Great British Baking Show for a few years now. It is such a lovely, calming competition show - basically the opposite of shows where contestants back-stab and sabotage each other. 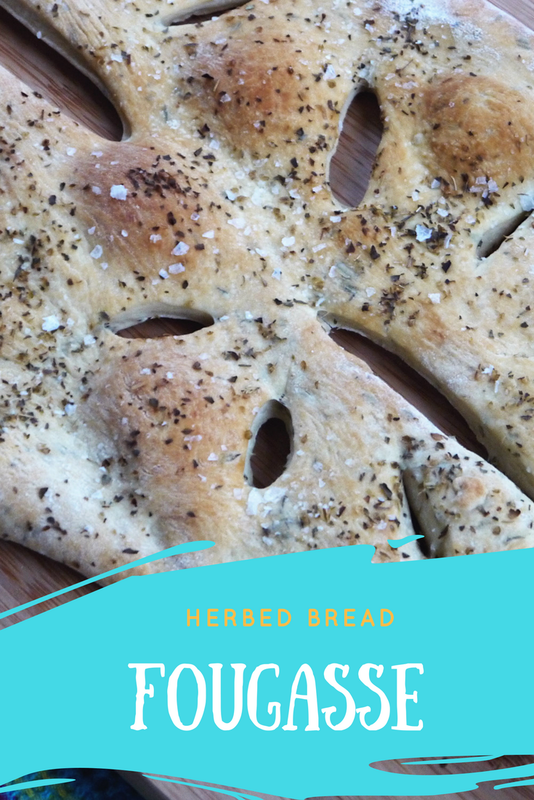 I have a decent baking vocabulary, but I'd never heard of Fougasse until I saw it on this season's botanical baking episode. 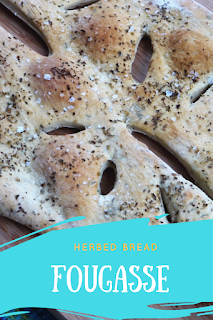 Fougasse is a french flatbread, filled and topped with herbs, and shaped to look like a leaf. I really love baking bread and wish I did it more often. It can be a little warm to bake bread in the summertime, but this bread is so quick and easy, it's not going to make you sweat. There's no kneading, it can all be done in a mixer with a bread hook. I used the recipe directly from the PBS Great British Baking Show website. I divided the dough in two and baked only one loaf to start. I tried to stretch and shape the dough by hand, like a pizza, but it ended up too thin in the middle and too thick on the outside, so it burned a bit in the oven. The unburnt parts still tasted amazing though! Since the dough is similar to pizza dough, I figured it would hold the same way in the fridge, so I refrigerated the second half of the dough for a few days until I was ready to try again. This time I used a rolling pin to roll out the dough evenly, and it worked perfectly. We ate our fougasse with a simple soup and salad dinner, but it is amazing dipped in oil and balsamic vinegar as an appetizer. It would also be a lovely gift to bring to a dinner party, to serve or for the hosts to enjoy on their own. Place the flour, salt and yeast into the bowl of an electric mixer fitted with a dough hook. Add the olive oil and three-quarters of the water. Begin mixing on low speed. As the dough starts to come together, add the remaining water very slowly. Mix for another 8 minutes on a medium speed. Add the rosemary, sage and thyme and mix for a minute until the herbs are evenly distributed in the dough. Place the dough in a large bowl that has been coated lightly with olive oil. Cover with plastic wrap and leave to rise in a warm place until at least doubled in size – about an hour. Dust the work surface with flour. Pour the dough onto the floured surface and divide the dough in half. You can shape and bake both loaves now, or refrigerate half the dough in a zip-top bag for up to five days. On parchment paper, roll each dough half into a flat oval. Using a pizza cutter make two cuts in a line down the middle of the ovals with a gap between them. Make 12 diagonal cuts in the dough, 6 either side of the central cuts, forming a leaf design, then stretch the dough out slightly to emphasize the holes. Lift the dough on the parchment and place onto a baking sheet. Place the baking sheet inside a large plastic bag and leave to rise in a warm place for 20 minutes. Spray or drizzle a little olive oil over the top of the loaf. Sprinkle with oregano and bake for 15–20 minutes, or until the fougasse sounds hollow when tapped on the base. Remove from the oven and while still hot, brush with more olive oil and sprinkle with sea salt.